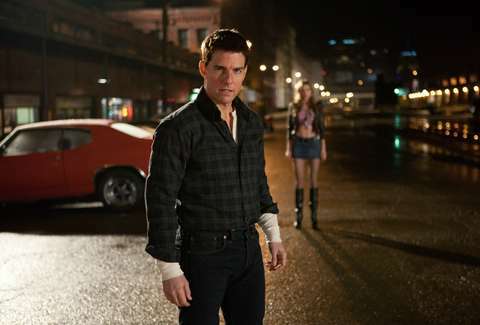 When Tom Cruise was announced to star in a potential series of Jack Reacher movies back in 2012, a certain subset of the population was more than a little confused. Namely, the subset of the population who actually spent time consuming Lee Child's wildly popular thriller novels, who were all aware that the protagonist of those books is canonically an absolute unit -- a much larger character than deceptively small actor Tom Cruise had any right to play. Think about that for a second: 6'5" is taller than most people, if not every person you've ever met, unless you're the manager of an NBA team. Add to that Child's enthusiastically imaginative descriptions of Reacher's body parts -- his fist alone is "the size of a supermarket chicken" when it emphatically slams down on a table in one scene -- and you get a man that sounds more like a cartoon than a real person. The Reacher debate has been going on for some time, many fans having gathered together to shame Cruise for his small stature and share memes on various Facebook support groups. At last, it looks like the people have gotten what they want, as Reacher will make his way to "Netflix or something like that," according to Child, and will probably be recast with a Wreck-It Ralph-sized actor who actually possesses dinner plate hands and "biceps like basketballs." And Cruise? He got two movies out of the deal, and he's already Ethan Hunt anyway, the star of his own way more successful action franchise. He'll be just fine.